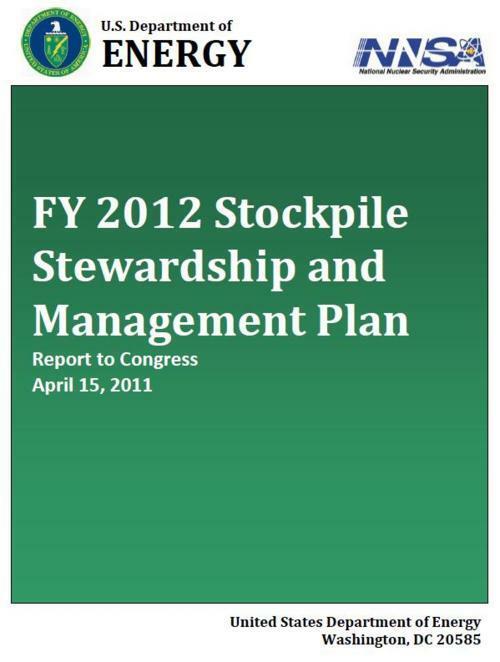 The FY2012 Stockpile Stewardship and Management Plan (SSMP), which was sent to Congress in April, is NNSA’s outline of its near- and long-term plans and associated costs for the U.S. nuclear weapons stockpile and supporting infrastructure. However, with national security spending facing real cuts below FY2011 levels for the next two years at a minimum, either the NNSA must overcome that trend or cut back on its plans.The FY2012 SSMP is unclassified but has two secret annexes. The new plan updates, with input from Congress, the FY2011 SSMP published last year, and is the first plan to fully incorporate the recommendations of the Obama administration’s 2010 Nuclear Posture Review. A new nuclear weapons plan from the National Nuclear Security Administration (NNSA), which seeks further increases in spending over the next decade for nuclear weapons and for weapons production and simulation facilities, will face real challenges in the new budget environment. The Obama administration has significantly increased the amount of money the United States spends on nuclear weapons, and had planned further increases before the Budget Control Act of 2011 was passed last month. The FY2011 budget proposed in early 2010 increased NNSA’s spending on Weapons Activities by nearly 10 percent relative to the previous year, and the administration later added another $5.4 billion for the 2011-2015 future years nuclear security program. According to the FY2011 SSMP, NNSA planned to spend about $80 billion from 2011 through 2020—or an average of $8 billion per year. In comparison, nuclear weapons budgets in the last years of the Bush administration were around $6.7 billion annually in inflation-adjusted dollars. The FY2012 SSMP shows that the NNSA plans additional funding increases, beginning with an additional $4 billion for the 2012-2016 future years nuclear program. The NNSA now plans to spend $88 billion on nuclear weapons and the nuclear weapons complex from 2012 to 2021, for a yearly average of $8.8 billion. This is another 10% increase on top of the FY11 SSMP increase. However, those budget levels may be less than what is required if NNSA’s plans do not change. In particular, cost estimates for two major facilities—the Uranium Processing Facility (UPF) in Oak Ridge, Tennessee and the Chemistry and Metallurgy Research Replacement-Nuclear Facility (CMRR-NF) in Los Alamos, New Mexico—are a cause for concern. The NNSA estimates that the UPF could cost $4.2 billion to $6.5 billion, and the CMRR $3.7 billion to $5.8 billion. The FY12 SSMP hints that the total for both might reach $12 billion, but a footnote in Table 6 on page 67 explains that the ten-year budgets above are based on those facilities coming in at the low end of the current cost estimates. Yet a recent independent estimate by the Army Corps of Engineers concluded that the cost of the UPF alone would be between $6.5 and $7.5 billion, which puts the low end equal to the high end of NNSA’s current estimate. Source: “FY 2012 Stockpile Stewardship and Management Plan Report to Congress, April 15, 2011,” Department of Energy, National Nuclear Security Administration, p. 68. 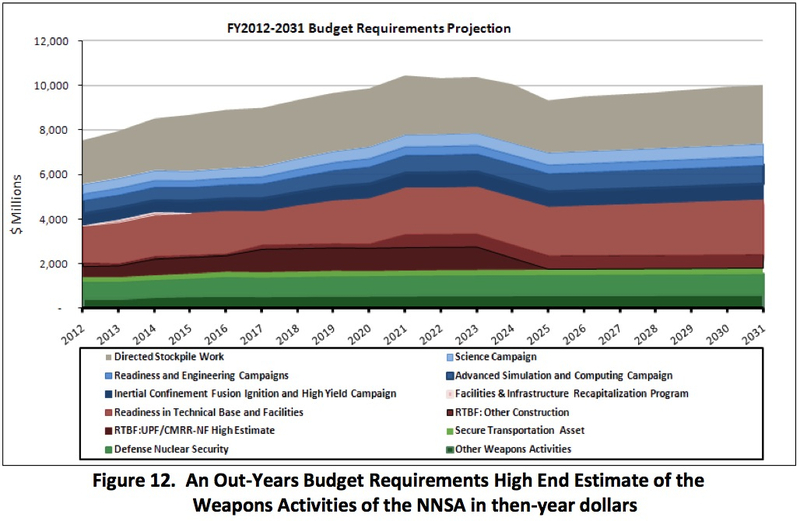 Figure 12, the budget requirements projection for FY12-31 above (taken directly from the FY12 SSMP) provides a budget estimate based on the high end of NNSA’s assumptions for all its costs. 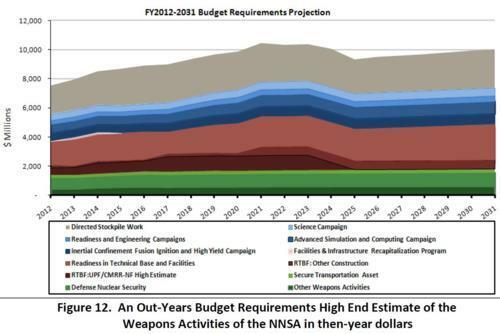 The chart indicates that the NNSA plans to spend over $120 billion between FY12 and FY24, when the CMRR and UPF are scheduled to be completed. Based on NNSA’s history, using these high end figures is probably a safe assumption, if not an underestimate. Gone from the FY2012 SSMP is the controversial statement made in the previous SSMP that “the costs to maintain capabilities necessary to support the stockpile are essentially independent of the size of the stockpile.” (Annex D, p. 2.) 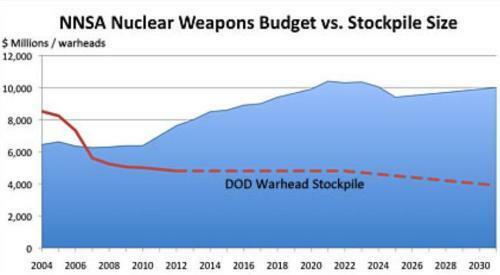 Yet it is clear from the new plan and other documents that the significant reduction of the U.S. nuclear weapons stockpile since 2004 has not resulted in any savings in NNSA’s budget, which will continue to increase due to more ambitious warhead modernization plans, cost overruns for the construction of new production facilities, and new simulation and testing facilities. The FY2012 SSMP shows that NNSA would like this trend to continue through the 2020s. See the chart below. That desire conflicts with the realities of the Budget Control Act. Rather than a second 10% budget increase as laid out in the FY12 SSMP, the Act calls for a half-percent decrease in national security spending across the board. The House has already passed its version of the key appropriations bill that provides NNSA funding, exacting roughly a 7% cut below the administration’s request for FY2012, leaving a budget less than 3% greater than the FY11 level. The version passed by the Senate appropriations committee was approximately 6% below the request, modestly higher than the House. Because of the Act’s limits, for at least the next several years, NNSA is likely to maintain that level of funding rather than the increased budgets it proposes in the FY12 SSMP. In short, to live within the new budget priorities that Congress and the administration agreed to in August, NNSA must make significant changes in the timing, scale, and extent of several major projects. Delays, downsizing and perhaps even cancellation of some current priorities seem almost inevitable. The question is: who will make these choices? Will it be the NNSA, the White House, or Congress? And how soon will these decisions be made? Nickolas Roth is Policy Fellow for the Center for Arms Control and Non-Proliferation and a graduate student at the University of Maryland, Hans Kristensen is the Director of the Nuclear Information Project at the Federation of American Scientists, and Stephen Young is a Senior Analyst at UCS.